The proposal to appoint Pujith Jayasundara as the next Inspector General of Police (IGP) is illegal, Pivithuru Hela Urumaya Leader Udaya Gammanpila stresses. The observation was made during a press conference held in Colombo this morning (19). Gammanpila went on to say the decision cannot be accepted since Minister Patali Ranawaka, who was in the spotlight following an accident in Rajagiriya, is also being part of the Constitutional Council. “Ranawaka showed his gratitude to the nominee. Now time for Pujith to show his gratitude,” Gammanpila added. He also pointed out the police would intend to procrastinate the investigation against the Minister due to the move. “S.M. Wickramasinghe is more senior. 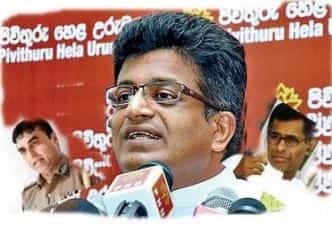 Yet the Constitutional Council had nominated Pujith Jayasundara,” Gammanpila said. Senior DIG Jayasundara was nominated as the next IGP by a majority of the Constitutional Council members last afternoon (18).